What is the Blue Star Programme? 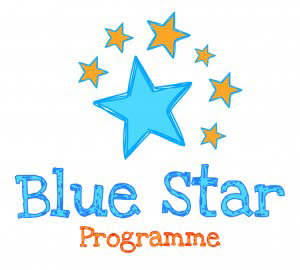 The Blue Star Programme is an education initiative for primary school pupils across Ireland. The idea of the Programme is simple: to foster better understanding and knowledge of the European Union and how it affects the lives of Irish citizens among primary pupils through classroom projects and activities. Pupils of all ages, from primary schools all over Ireland, are challenged to get creative and think about Europe by carrying out projects in relation to four key elements: the history, geography, culture and creativity, and Institutions of the EU. The Blue Star Programme aims to introduce participants (pupils, teachers, parents and the wider community) to the EU, what it means and how it works. The Programme also aims to foster a strong sense of awareness of the EU among its participants that reaches far beyond the school walls and out into the wider community. The Blue Star Programme has creativity at its core and its structure, and project work encourage teachers and pupils from all corners of Ireland to ‘think outside the box’. The wider school community is also encouraged to get involved and contribute to the Programme. One of the advantages of this Programme is its flexibility. You, the teacher, can decide whether your entire school completes the Programme or whether you just want individual classes to participate. Above all, the Programme is designed to be as curriculum friendly as possible so that it can fit in with lesson plans already in place. Schools interested in taking part in the Blue Star Programme, or even those who just want to learn more about what is involved, are invited to register before Friday 28 September 2018. Participating schools will then be asked to submit a short Action Plan to the Blue Star National Coordinator (which has been European Movement Ireland since 2011), outlining the goals they hope to achieve over the course of the school year and how they plan to fulfil the Programme requirements. At the end of the year, schools are then required to submit a Final Report outlining how each of the four key elements (historical, geographical, cultural and creative, and Institutional) were explored over the course of the year. Schools are also required to host an event for Europe Day such as an art exhibition, concert, parade or food fair. Each school’s Final Report is assessed by the National Coordinator. All schools that successfully complete the Blue Star Programme are awarded Blue Star Certificates of Achievement, signed by the Minister for European Affairs, and a European flag. 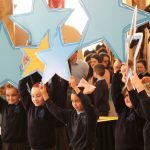 Following the pilot year of the Programme in 2011-2012, 32 schools, small and large, from around Ireland were awarded their Blue Star Certificates of Achievement and the feedback from pupils and teachers alike was overwhelmingly positive. Since the pilot year, the Blue Star Programme has gone from strength to strength. In the 2012-2013 school year, almost 100 schools registered to participate, with Blue Star Certificates of Achievement being awarded to all those who successfully completed the Programme in June 2013. The 2013-2014 Blue Star Programme saw 106 schools register their interest, with an estimated 90 schools completing the Programme. We estimate that approximately 12,000 pupils participated in the Programme during the 2013-2014 school year. The 2014-2015 Blue Star Programme saw 175 schools register to participate with 108 schools successfully completing the Programme. We estimate that there was almost 15,000 pupils participating from every corner of Ireland during this school year! In 2015-2016, the Blue Star Programme saw 190 schools register to participate while in 2016-17, 161 schools participated. Throughout the years, the Programme and participating schools have also enjoyed widespread national and regional print, radio and television media coverage, highlighting the successes of the teachers and pupils who took part. More in-depth detail on how the Programme works and what is involved is contained in the Resource and Registration Pack, which can be downloaded below. A Teacher’s Guide has also been developed in cooperation with previous Blue Star Champion Teachers which serves as a useful aide for teachers participating in the Programme for the first time. Teacher’s Guide to Integrating the Blue Star Programme – Blue Star Teacher’s Guide Year 8. You’ll find more helpful materials on our Resources page here. Furthermore, we have an FAQ page to help our participating Blue Star teachers with the Programme. We really enjoy participating every year. It’s very easy to fit in with our school curriculum as we would be doing a lot of the activities already. Therefore it’s wonderful to make it a school based project and event so all classes can showcase what they have been doing and everyone learns something. The project really highlights our place in Europe and has had a really positive effect on the children, parents and teachers. It is very well run and we will certainly keep getting involved, maintaining what we have achieved already and trying out new things as well. I have really enjoyed teaching this to the children and I know by their level of knowledge and confidence in speaking about the topic that I have given them a fantastic foundation going forward into the future. I think young people should take more interest in whats happening around them and be aware of their country and membership of such a Union. Our experience of this project is hugely positive. And the children’s final reports reflect this sentiment entirely. They loved all aspects and they themselves felt they learned a great amount. I do think having one of the Irish MEPs visit us was the actual ‘icing on the cake’. It made the pupils feel that their work was being acknowledged and equally they loved listening to her responses. I can honestly say that this Blue Star Programme was one of the most rewarding projects we have participated in over the years, and I have done quite a few!! It is a great idea and I would certainly encourage other schools to get involved. It is of course a very interesting topic and it integrates marvellously with so many curricular areas… The whole project was a huge learning experience, not only in terms of actual learning but it also upped IT skills, file management, editing, PowerPoint presentation, etc. A particular highlight of the Programme was to witness children teaching each other, i.e. the 6th class pupils delivering their PowerPoint on the European Institutions to the other classes. This is something that we, as a staff, look forward to exploring further. There was a real “feel good” factor to our Europe Day… The children derived enormous satisfaction out of showcasing their various projects as well as other dramatic and musical performances. We really enjoyed participating in the Blue Star Programme. All of the pupils found it very interesting and enjoyed all elements of the Programme. The Programme integrated many themes and topics of the SESE curriculum. In addition, the writing and presentation of reports integrated with the English Literacy curriculum. In the busy Irish Primary Curriculum, many offers of external projects are not taken up because of the time factor. This project appealed to me because it had very defined guidelines and an easily visible framework. Allied to this, the resources were of a very high quality, not just in pedagogical content but also in production, e.g. good DVD, quality paper, bright and colourful images in maps and text materials. All these materials prompted research which was a big element in the development. The computer skills of the children were developed unrecognisably! From initially being able to type an essay in Microsoft Word, the children graduated to a level of technological competence that would merit a certificate! They are now competent at independently researching a topic online, they are able to download pictures, sounds and animations. Familiarity with PowerPoint has equipped them with the ability to utilise PowerPoint animation features to create a clever educational presentation. The beauty of this Programme for us was that it afforded all our families the opportunity to celebrate our diversity, learn about and enjoy our cultural differences and understand where we’ve come from. We received fantastic support from all our parents and students. Our Polish families revelled and taught us so much of their backgrounds, foods, interests, families and hopes. It is the first initiative that really has incorporated the entire school community and the feedback from it was fantastic. It is our hope that it will remain a permanent fixture on our school calendar. For more information on Blue Star 2016-2017 and to find out how your school can join the Programme, contact bluestar@europeanmovement.ie or call the EM Ireland office in Dublin on 01 662 5815. The Blue Star Programme is a venture of the Communicating Europe Initiative, supported by the Office of the Minister of State for European Affairs, Department of Foreign Affairs and Trade, the Department of Education and Skills, the European Commission Representation in Ireland and the European Parliament Information Office in Ireland.